BATON ROUGE — The Chamber of Commerce of East Baton Rouge hosted a Candidates Forum for candidates in the April 9 special election for state representative from House District 29. The election is to fill a vacancy left by the death of Rep. Ronnie Edwards (D-Baton Rouge). Participating in the forum were Rev. Albert White, Victor Woods and Edmund Jordan. Two other candidates were unable to attend: Tyra Banks Sterling and Vereta Lee. The Chamber EBR meets at 12 noon on the 4th Tuesday of each month at Café Américain, 7521 Jefferson Hwy. in Baton Rouge. 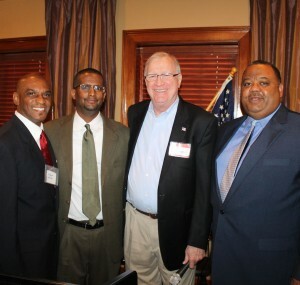 PHOTO: Albert White, Edmund Jordan, Chamber EBR chairman Cecil Cavanaugh, and Victor Woods.